Perhaps it’s just me, but primary school geography always seemed full of trees. From the African savannah and the Amazonian rainforest, to the jungles of Borneo and the conifers of Scandinavia, other countries were where you’d find extraordinary trees. If Australian trees were mentioned at all, it was the jarrah and karri forests of Western Australia. And that may as well have been a foreign country. The place we’re staying is less than a kilometre away. The evening is cool and overcast, and the fire is downwind of us. Curious, we return after dark to watch. This is no inferno. Flames ripple and trickle across the forest floor; climb half-heartedly up trunks; lick lower branches clean of leaves. For the most part the sound is that of gentle waves on a distant shore. Occasionally there is a roar as flames create a Roman candle inside a hollow tree; a crash as those flames bring the tree crashing to the blackened earth in a spray of sparks. In the morning the fire continues to creep through the jarrah. 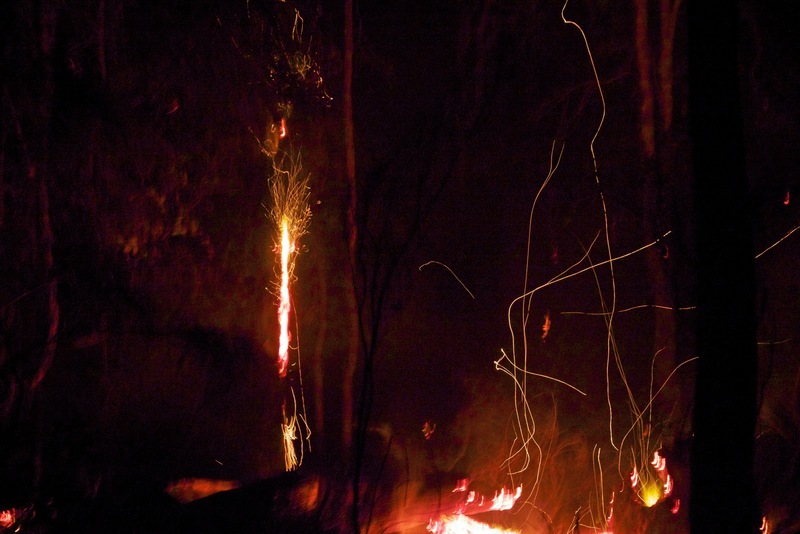 We drive a few kilometres away to an unburned karri forest. 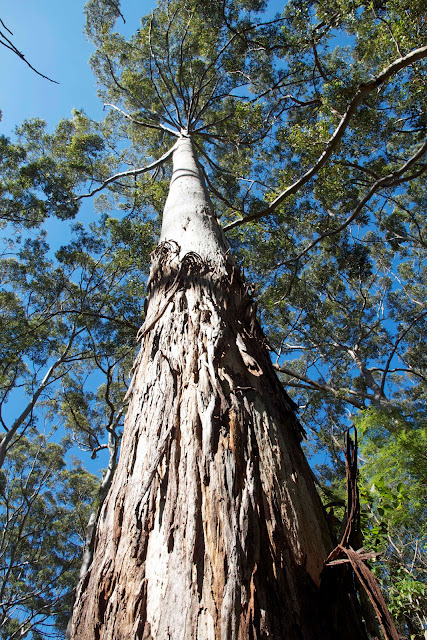 It is the first time I’ve seen karri (Eucalyptus diversicolor), and I’m keen for a close-up view. We walk into the forest. It is still and quiet, except for the occasional cheee-wit of a golden whistler. That at least is completely familiar. Likewise the bracken undergrowth. Although it is a little late for wildflowers, there are hibbertia and crowea flowers that are not unlike eastern varieties. But there is something else – something elusive – that distinguishes this from the eucalypt forests I am used to seeing “over east”. 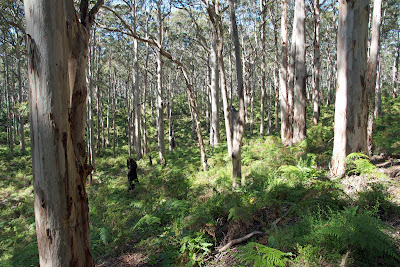 Although this is regrowth forest, maybe only a few decades old, the trees are already giants, already full of character. Their anthropoid curves and sleeves-rolled-up limbs give them a profoundly soulful presence. I feel like a late-arriving dinner guest. The other “guests” have paused mid-sentence to turn and stare, benign but curious. As we walk back to the car I’m tempted to turn suddenly, to see if I can catch the karri turning back to their animated conversation. Perhaps next time. Thanks for the comment gnangarra, and for the link to your photos. Beautiful!